The research of the THEP group deals with various aspects of the fundamental interactions of nature and of the elementary constituents of matter. It ranges from perturbative quantum field theory for the strong and electroweak interactions of quarks and leptons to effective field theories, theories within non-commutative geometry, nonperturbative quantum gravity and string theory. Research in phenomenological particle physics centers on collider physics, flavour physics, perturbative quantum field theory at higher orders, and effective field theories for heavy and light quarks. On a more theoretical side, the research covers the mathematical structures of scattering amplitudes, algebraic Yang-Mills-Higgs theories and their quantization, and fixed-point theories of quantum gravity. The theory group of the Nuclear Physics Institute studies the strong interaction at low and medium energies. The activities focus on the theoretical interpretation of the experiments at MAMI and at other accelerator facilities. Beside analytical methods like effective field theories and dispersion theory numerical simulations of Quantum Chromodynamics (QCD) on the lattice are applied. 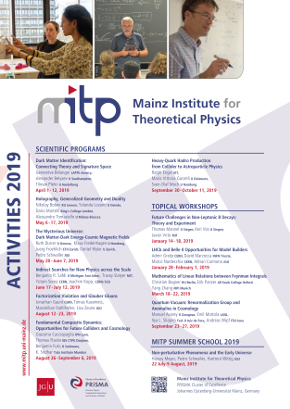 Research topics include hadron structure and meson production, flavour physics, QCD at finite temperature and density, and hadronic contributions to the anomalous magnetic moment of the muon.